Citation: Teschke R. Intoxications by aliphatic halogenated hydrocarbons: hepatotoxic risks for patients and clinical issues including role of CO2- induced hyperventilation as therapy option. J Clin Exp Tox. 2018;2(1):20-24. Aliphatic halogenated hydrocarbons, carbon tetrachloride, solvents, forced CO2-induced hyperventilation, cimetidine, liver injury, ROS. Clinical hepatology covers a broad range of liver diseases with their challenges of diagnosis and therapy. Although the diagnosis of a liver disease itself can easily be established by assessing liver tests such ALT (alanine aminotransferase) and AST (aspartate aminotransferase) showing increased values in the blood, the causes of liver diseases are more difficult to explore. These can be traced back to various conditions such as virus infections by hepatitis B or C, nonalcoholic fatty liver disease, genetic or environmental causes, drugs [1,2] or uptake of toxins [2-15]. There is a broad range of liver diseases due to toxins, with a high prevalence of alcoholic liver disease, well evaluated clinically and experimentally regarding therapy and pathogenesis [2-6], and a much lower prevalence of toxic liver diseases by other chemicals such as synthetic drugs and phytochemicals . Nowadays, cases of liver injury due to occupational chemicals or solvents are still clinical challenges but occur less frequently because of strict regulatory requirements at the working place, which help reduce health hazards. Similarly, cases of liver injury by solvents such as aliphatic halogenated hydrocarbons published in the scientific and medical literature are limited with respect to therapy and pathogenesis despite some reports [7-15], and overall clinical experience is rarely available in this clinical field of hydrocarbon intoxication. In the present concise review article, some selected case details of 60 patients with acute intoxication by aliphatic halogenated hydrocarbons are discussed and treatment options are recommended. These include forced removal of the potentially toxic hydrocarbons via the lungs through CO2- induced hyperventilation and applying drugs competing at the microsomal level with the toxins. Efficient competing would allow reducing the generation of hepatotoxic metabolites by preventing deleterious events promoted by microsomal drug metabolizing enzymes in the liver under these clinical conditions. The aim of this report is to increase awareness that patients with these intoxications should receive active therapy rather than experience any wait and see approach. The PubMed database was used to identify publications for the following terms: Aliphatic halogenated hydrocarbons; carbon tetrachloride; aliphatic hydrocarbons; aromatic hydrocarbons; cyclic hydrocarbons; solvents; all search items were used alone and combined with the terms of forced CO2-induced hyperventilation, liver injury, ROS, and cimetidine. Reports in the English language were preferred. The search for publications was completed on 11 February 2018. A large and actualized private scientific archive was also used as data source. Hydrocarbons are a heterogeneous group and include organic substances primarily composed of carbon and hydrogen molecules . They include gasoline, lubricating oil, motor oil, mineral spirits, lighter fluid/naphtha, lamp oil, kerosene, dry cleaning solutions, paint, spot remover, rubber cement, and solvents. In addition, many volatile substances like glue or propellants contain hydrocarbons and are abused for their euphoric effects. Hydrocarbons can be classified as aliphatic, in which the carbon moieties are arranged in a linear or branched chain, or aromatic, in which the carbon moieties are arranged in a ring . Halogenated hydrocarbons are a subgroup of overall hydrocarbons, in which one of the hydrogen molecules is substituted by a halogen group [7-16]. Under clinical aspects, the most important halogenated hydrocarbons are carbon tetrachloride (CCl4), trichloroethylene, tetrachloroethylene, trichloroethane, chloroform, and methylene chloride [8-16]. Qualitative and quantitative toxin analysis can be performed for instance in human blood using the head-space gas chromatography (GC) techniques, as also described for a patient with an acute intoxication by CCl4 . We also used for toxin detection in the exhalation air the Draeger-tube® system supplied by Draeger, Lübeck in Germany . According to the information of the manufacturer, DrägerTubes® are glass vials filled with a chemical reagent that reacts to a specific chemical or family of chemicals. A calibrated 100 ml sample of air is drawn through the tube with the Dräger accuro® bellows pump. If the targeted chemical is present, the reagent in the tube changes color, and the length of the color change typically indicates the measured concentration. The DrägerTubes® System is the world’s most popular form of gas detection. Aliphatic halogenated hydrocarbons can readily be found in the blood of patients after acute intoxications  and in animals . For instance, peak levels of CCl4 as determined by headspace GC were observed 3–6 hours following an acute oral dose of CCl4 in the blood, liver and fat of rats . Subsequently, there was a rapid decline of CCl4 levels. Conversely, serum activities of enzymes originating from the liver such as AST and ALT increased considerably and showed activity peaks between 12–48 hours following CCl4 administration, indicating a delayed response of CCl4 on the activity levels of enzymes in the blood. Chlorinated aliphatic hydrocarbons show variability in their toxicity and their chemical structure, with differences in their partition coefficient (blood versus air), solubility in water, total pulmonic and renal excretion, and lethal dose . Consensus exists that numerous halogenated hydrocarbons of the alkane, alkene, and alkyne classes are metabolized by cytochrome P450 (P450) enzymes to products that elicit cytotoxic and/or carcinogenic effects. Such halogenated hydrocarbons include not only anesthetics like halothane and enflurane, but also industrial solvents like carbon tetrachloride, chloroform, and vinyl chloride . Formation of reaction intermediates from these compounds occurs via P450-promoted dehalogenation, reduction, or reductive oxygenation, with certain hydrocarbons undergoing all three reaction types. Of the multiple forms of P450 present in liver microsomes, P450 2E1 has been identified as the primary enzyme catalyst of hydrocarbon bioactivation in animals and, most likely, in humans as well. Interestingly, P4502E1 is induced after chronic alcohol consumption and is also an important component of the hepatic microsomal ethanoloxidizing system (MEOS) which degrades ethanol [4,19-21]. This ethanol-induced P450 2E1 is likely responsible for the increased CCl4 hepatotoxicity after chronic alcohol consumption in animals , and similar problems may apply to the cohort of intoxicated patients, some of these co-ingested alcohol whereas others had a history of chronic alcohol consumption . The cascade of events leading to liver injury starts with the passage of the lipophilic aliphatic halogenated hydrocarbons such as CCl4 through the plasma membrane of the hepatocyte, which consists of a phospholipid bilayer. CCl4 for instance will be metabolized to toxic radicals such as trichloromethyl radical *CCl3 by CYP450 2E1 via a NADPH dependent, molecular oxygen requiring reaction in the endoplasmic reticulum . This organelle structure corresponds to the microsomal fraction of the biochemists. Radicals with their high binding potential to proteins and lipids including phospholipids will then injury structural proteins of mitochondria and the endoplasmic reticulum through a cascade or chain of reactions, leading to necrosis and apoptosis of liver cells [15,22]. Only small amounts of aliphatic halogenated hydrocarbons such as CCl4 are commonly metabolized to radicals whereas a large portion remains unchanged and is likely less toxic . At variable extent, hydrocarbons are eliminated through the lungs [23-25]. These pathogenetic considerations help understand the clinical course and provide a concept for treating efficiently intoxicated patients. Most importantly, forced ventilation will decrease blood levels of the unaltered hydrocarbons through accelerated poison exhalation (Table 1). Other proposed measures include the need of intestinal lavage in patients intoxicated by ingestion, and intravenous application of a drug such as cimetidine, which reduces microsomal drug metabolizing enzymes and thereby limits the degradation of CCl4 (Table 1). In addition, the application of high amounts of glucose under regular control of blood glucose levels is recommended to facilitate down-regulation of microsomal enzymes metabolizing drugs including CCl4. 2. Endotracheal intubation after evaluation for risk of aspiration + ? 3. Primary toxin elimination by gastro-intestinal lavage in the intubated patient + ? Table 1. Therapy of adult patients with acute intoxications due to aliphatic halogenated hydrocarbons. For the hyperventilation therapy, clinicians with expertise in pulmonology are required for surveillance of the patients and early recognition of adverse events that may occur due to the use of CO2 or in the course of respiratory-assisted ventilation. In Germany, the Heinrich Heine University of Düsseldorf with its intensive care units of the Children’s Hospital  and Internal Medicine Department  soon became a center specialized for intoxications by hydrocarbons, due to referrals of many patients from other parts of Germany and recommendations provided by poison control centers to inquiring physicians and hospitals. However, establishing and maintaining such a center is a clinical and financial challenge, requiring a high degree of management resources with focus on professional skills and empathy. Basic information was derived from treating children as specified elsewhere . Major problems were seen in children below five years of age, because they are not able to increase their respiration minute volume sufficiently for hours or days until most of the intoxicating hydrocarbons are eliminated. Therefore, hyperventilation in children was achieved using a respirator. To avoid respiratory alkalosis, CO2 was added to the inspiration gas which may increase the respiratory minute volume up to three or four times of the normal values. This prevents the necessarily emerging respiratory alkalosis, which otherwise would lead to death after a short period if not recognized in time and instantly corrected . Prior to transport of the patient to the community hospital or the specified center, the decision has to be made on early endotracheal intubation to prevent aspiration (Table 1). In the absence of intubation, a position of the patient must be chosen during the transport that reduces aspiration risk in case of vomiting. An initial bolus of intravenous cimetidine (200 mg) should be provided (Table 1) with the intention to minimize microsomal conversion of the basically non-toxic CCl4 to toxic metabolites in the liver. Forced vomiting to remove gastric toxin content in patients with acute ingestion of aliphatic halogenated hydrocarbons is discouraged due to the risk of aspiration of the ingested toxin and expected pulmonary complications. Instead, early endotracheal intubation is recommended if not yet done, because many patients suffer from various degrees of narcosis, nausea and vomiting, conditions commonly associated with the risk of aspiration. Endotracheal intubation is also required if gastro-intestinal lavage is required (Table 1). Endoscopic removal of the ingested hydrocarbon is not recommended, because the toxin by virtue of its strong solvent property may damage parts of the gastroscope. As the therapy of choice, gastro-intestinal lavage is instead strongly recommended (Table 1) if the toxin is still suspected in the gastrointestinal tract. For instance, presence of carbon tetrachloride in the intestinal tract can be verified by an abdominal x-ray which shows opaque changes. Gastro-intestinal lavage is only allowed in an intubated patient. Cimetidine should be applied regularly after the initial bolus, also high dosed glucose, and liquemine to minimize the risk of disseminated intravascular coagulation (DIC), synonym for consumption or consumptive coagulopathy. There is usually no indication for an antibiotic treatment unless infections emerge such as pneumonia. As treatment conditions differ substantially from those in children , separate recommendations are given for the hyperventilation therapy in adults with acute intoxication by aliphatic halogenated hydrocarbons (Table 1) . Therapy should be started right after gastro-intestinal lavage has been completed, and when endotracheal intubation is not any more needed. Forced hyperventilation aims to increase pulmonary excretion of the hydrocarbons, ideally in an adult or adolescent patient lacking respiratory insufficiency. Artificial hyperventilation is achieved by CO2, applied to the patient in a sitting bed position. CO2 must be of pure quality and suitable for human use, commonly supplied by the hospital infrastructure or in gas cylinders, safely placed nearby the bed and the head of the patient. The patient inhales the CO2 via a sealed nasal tube, known as nasal oxygen tube. Concomitantly, the patient inspires usual air by open mouth and alternately expires the contaminated air by mouth. CO2 is applied at a flow rate of 2-3 liter per minute through the nasal tube, and with regular inspiration of CO2 via the nasal tube, an increased respiratory volume of up to 25- 30 liter per minute should be achieved . If the nasal tube is not tolerated, it can be replaced by CO2 application through a commonly available, not tightly placed oxygen mask, but this approach is less effective and associated with the risk of again inhaling the contaminated exhalation mixture. In some patients respiratory insufficiency may develop, requiring endotracheal intubation and the use of a respirator such as the Bird-system; CO2 is then added at a flow rate of 2-3 liter per minute to the respiratory mixture to achieve hyperventilation. This is a critical clinical situation for which decisions are required on a case by case basis. In general, patients with a preexisting chronic obstructive pulmonary disease should not be candidates for a CO2-induced hyperventilation therapy due to the unfavorable benefit versus risk constellation. As this therapy is not without risks, skilled physicians preferentially pulmonologists should care for these patients in a setting of an intensive care unit. The therapy requires a 24 hour surveillance of the patient with regular measurements of the respiratory minute volume as well as blood gas analyses in order to early recognize complications. Needless to say, constant room ventilation is required to remove the exhaled toxin. Among 60 adult patients under consideration and receiving the CO2-induced hyperventilation therapy, 43 patients were males and 17 females, with details described earlier [14,25]. Age of the patients was 41.1 ± 3.9 years, with a significantly higher ages in patients with unintentional poisoning as compared to those with intentional intoxication ( 49.8 ± 6.5 years vs. 31.6 ± 2.8 years; p<0.005). All patients experienced intoxication by one of the commonly accessible aliphatic halogenated hydrocarbons or by combinations thereof. With a single toxin as cause, a high frequency was found for 1,2-Dichloroethane (18 patients), followed by trichloroethylene (13 patients), and carbon tetrachloride (12 patients). Duration of the hyperventilation therapy was 106.0 ± 10.5 hours among the 60 patients . At hospital admission and as expected, clinical presentation of intoxicated patients was variable, depending on the toxic hydrocarbon and the interval between intoxication and admission. Initial symptoms may include narcosis, confusion, general seizures, nausea, vomiting, abdominal pains, diarrhea, gastrointestinal bleeding, and cardiac arrhythmias. With subsiding of these initial symptoms of the first phase, a clinically silent phase or free interval usually emerged as second phase, also illustrated by increased ALT and AST values between days 4 and 5 after the acute intoxication (Figure 1). This silent second phase often misleads the physicians and patients but does not allow for premature termination of the hyperventilation therapy. The final third phase is commonly more severe and may include pronounced liver injury, jaundice, renal insufficiency, and toxic bone marrow damage. During the third clinical phase, liver values may increase up to 6,000 U/l (Figure 1), but in some patients they rose to values between 10,000 and 20,000 U/l. Discharge calculated from the day of intoxication was after 14.5 ± 1.5 days. 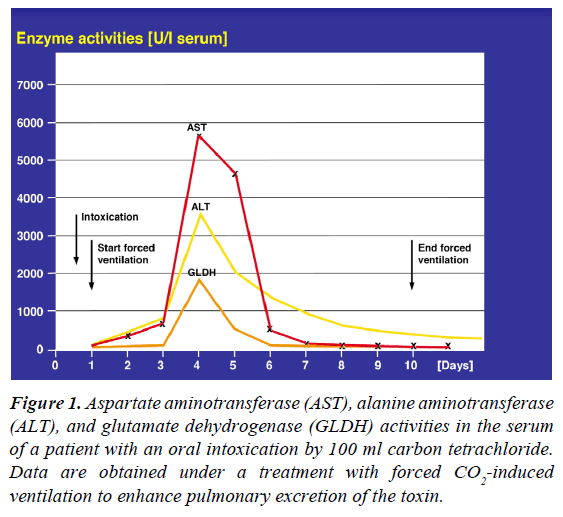 Figure 1: Aspartate aminotransferase (AST), alanine aminotransferase (ALT), and glutamate dehydrogenase (GLDH) activities in the serum of a patient with an oral intoxication by 100 ml carbon tetrachloride. Data are obtained under a treatment with forced CO2-induced ventilation to enhance pulmonary excretion of the toxin. Among 110 children intoxicated by aliphatic halogenated hydrocarbons and treated with forced hyperventilation, 3 children died corresponding to 2.7% . The clinical course of 60 adult patients with CO2-indued hyperventilation as therapy for their acute intoxication by various aliphatic halogenated hydrocarbons had a lethal outcome for 4 patients corresponding to 6.7% . The fairly good prognosis observed in patients [9,14] is in line with clinical and experimental studies showing increased pulmonary disposal of the toxins due to the hyperventilation therapy [7-10,25]. In patients with acute intoxication by aliphatic halogenated hydrocarbons, treatment modalities include forced CO2- induced hyperventilation as a practicable therapy option to increase pulmonary excretion of the volatile toxins. Using forced ventilation in 60 adults, a lethal outcome was observed in 4 patients corresponding to 6.7%. Published results from children under a similar treatment showed a lethality rate that was with 2.7% even lower. Based on these encouraging results, patients with intoxications by volatile hydrocarbons should receive this special form of therapy and not wait for a wait and see approach. The author has no conflict of interest to declare with respect to this invited review article. Danan G, Teschke R. RUCAM in drug and herb induced liver injury: The update. Int J Mol Sci 2016;17:14. Younossi ZM, Stepanova M, Affendy M, et al. Changes in the prevalence of the most common causes of chronic liver diseases in the United States from 1988 to 2008. Clin Gastroenterol Hepatol 2011;9:524-30. O’Shea RS, Dasarathy S, McCullough AJ. Alcoholic liver disease. Am J Gastroenterol 2010;105:14-32. Teschke R, Matsuzaki S, Ohnishi K, et al. Microsomal ethanol oxidizing system (MEOS): Current status of its characterization and its role. Alc Clin Exp Res 1977;1:7-15. Lieber CS. Alcohol and the liver. Gastroenterology 1994;106:1085-105. Teschke R. Alcoholic steatohepatitis (ASH) and alcoholic hepatitis (AH): Cascade of events, clinical aspects, and pharmacotherapy options. Expert Opin Pharmacother 2018. Gellert J, Goldermann L, Teschke R. Effect of CO2 induced hyperventilation on carbon tetrachloride (CCl4) levels following acute CCl4 poisoning. Intensive Care Med 1983;9:333-7. Goldermann L, Gellert J, Teschke R. Quantitative assessment of carbon tetrachloride levels in human blood by head-space gas chromatography: Application in a case of suicidal carbon tetrachloride intoxication. Intensive Care Med 1983;9:131-5. Lemburg P, Sprock I, Bretschneider A, et al. A new concept of therapy in accidental intoxications with halogenated hydrocarbons. Vet Hum Toxicol 1979;21:37-40. Pebay-Peyroula F, Nicaise AM. Élimination pulmonaire des toxiques mesure applications toxicologiques. J Eur Toxicol 1970;5:300-8. Frenzel H, Heidenreich T, Gellert J, et al. Protective effect of CO2 induced hyperventilation on the hepatotoxicity elicited by carbon tetrachloride. Liver Int 1982;2:376-84. Teschke R, Hauptmeier KH, Frenzel H. Effect of an acute dose of ethanol on the hepatotoxicity due to carbon tetrachloride. Liver Int 1983;3:100-9. Teschke R, Vierke W, Goldermann L. Carbon tetrachloride (CCl4) levels and serum activities of liver enzymes following acute CCl4 intoxication.Toxicol Letters 1983;17:175-80. Teschke R. Forced ventilation as therapy for acute intoxications due to halogenated aliphatic hydrocarbons. Experience in 60 patients. Therapiewoche 1987;37:339-44. Hasumura Y, Teschke R, Lieber CS. Increased carbon tetrachloride hepatotoxicity and its mechanism after chronic ethanol consumption. Gastroenterology 1974;66:226-34. Acton A. Halogenated Hydrocarbons. Advances in Research and Application 2013. Draeger. Draeger gas detection devised 2018. Raucy JL, Kraner JC, Lasker JM. Bioactivation of halogenated hydrocarbons by cytochrome P4502E1. Critical Rev Toxicol 1993;23:1-20. Teschke R, Gellert J. Hepatic microsomal ethanol-oxidizing system (MEOS): Metabolic aspects and clinical implications. Alc Clin Exp Res 1986;10:20S-32S. Lieber CS. Cytochrome P-4502E1: its physiological and pathological role. Physiol Rev 1997;77:517-44. Stoyanovsky DA, Cederbaum AI. Metabolism of carbon tetrachloride to trichloromethyl radical: An ESR and HPLC-EC study. Chem Res Toxicol 1999;12:730-6. McLean AEM. Drugs, diet and liver injury. In: Drugs and the Liver by Gerok W and Sickinger K. Schattauer Stuttgart 1975; pp:143-8. Morgan A, Black A, Belcher DR. The excretion in breath of some aliphatic halogenated hydrocarbons following administration by inhalation. Ann Occup Hyg 1970;14:219-33. Teschke R, Goldermann L, Vierke W, et al. Forcierte Ventilation. In: Aktuelle Intensivmedizin 1, Diagnose, Verlaufskontrolle and Therapie schwerer exogener Vergiftungen by Deutsch E, Kleinberger G, Ritz R, Schuster HP, Schattauer Stuttgart 1984;pp:117-31.